Of all the products and services that Blood-Horse offers, our most popular is probably the Stallion Register -- now celebrating 75 years of being America's guide to Thoroughbred stallions. I wanted to point out a few updates we've made recently to the free Web version, the Stallion Register Online (SRO). 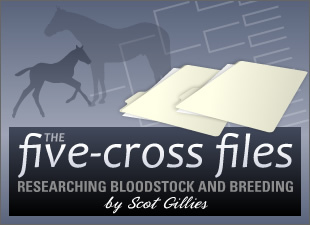 Since many of you are Thoroughbred breeders who consult the site regularly, you'll want to know how to get the most out of it. First up is our new partnership with Australia's stallion directory Bluebloods (aka Stallions.com.au). All Bluebloods stallions from the Antipodes (uh, that is, Australia and New Zealand... I just wanted to use a word I don't think I've ever put in print before) are now available in SRO searches. Additionally, we have a list of the full Bluebloods roster linked from our home page. The partnership with Bluebloods' Stallions.com.au site is similar to our relationship with the Weatherbys Stallion Book, and the Weatherbys roster also has a link from the SRO home page. Weatherbys stallions in England, Ireland, and continental Europe have appeared in SRO search results throughout 2009. We also made a style change to show races in furlongs rather than mile fractions, added race purses, and reformatted some of the broodmare sire data. And finally -- the enhancement that will keep you coming back to the SRO more frequently than ever before -- is race videos. You'll be able to watch races and view race charts for a stallion's top performers, right from the stallion's feature page. Just look for the video icon next to a race name. Click it and the video will appear immediately. Or, if you're prefer to see the race chart, just click on the name of the race (or of the horse that won/placed) and a new page will appear with the race chart and a stakes recap (if available) along with the race video. A good example is A.P. Indy (SRO). Under the sections titled "A.P. Indy's Current Top Performers Worldwide" and "A.P. Indy's Recent Northern Hemisphere Winners and Stakes Performers," you'll find charts and video links for his top progeny. And that's not all the video on SRO pages. For young sires who raced in 2007 or later, you can watch their race videos. Take a look at the "Big Brown's Race and (Stakes) Record" section on the Big Brown (SRO) page. View his big Derby and Preakness triumphs, his turf win in the Monmouth Stakes, ... even his maiden special victory as a juvenile!